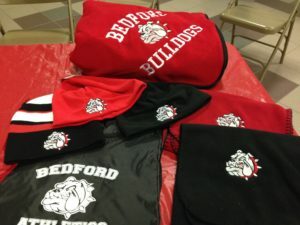 The Bedford Bulldog Athletic Booster Club is now offering Bulldog Wear so athletes and families can show their support of all Bedford athletics! All items are embroidered with the Bulldog image. You can print out our order form and turn your order in at the BHS Athletic Office. Please make your check out to BBABC. If you have questions about Bulldog Wear please email apparel@bbabc.net. A portion of the proceeds from all purchases of Bulldog Wear will go to helping the BBABC further its mission.